This is total cheater recipe. Though you’d never know it when you took a bite. Comforting with deep rich Mexican flavors, this stew-like soup tastes like it’s been simmering over the stove for hours. In reality, it’s been simmering over the stove for about 10 minutes. Sometimes even a food blogger like me needs a break from cooking. 1. Rinse and drain the black beans and place them in a large saucepan. Drain the diced tomatoes and add them to the black beans. Add the chile verde and cook over medium high heat breaking up the pork with a spoon and stirring occasionally until warmed. 2. Ladle into individual bowls and top with condiments of your choice. Serve with tortillas. 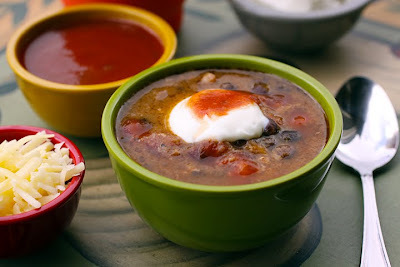 This is a wonderful fast way to enjoy small soups in very little time. Served up with condiments like sour cream, tortilla chips and shredded cheese-it's got to be good. We think almost exactly alike!! This dish looks great. I can't believe how quick it is to make. Lovely, enticing photos as usual!! If I knew how to put a tilde on it from my Mactop I would Memoria. I would also put on in your name too. So sorry! Cheater recipe or not, it looks wonderful. I'm always happy for some Mexican flavors. :) Love the picture! Easy and delish. Can't beat that! oh my, yummmmmm.... I need to try this one! I love a good quick soup! Looks like the perfect meal for the chilly days! Thanks for sharing! brilliant! I agree with you on the taking a break from cooking once in a while thought. Reminds me, the title of the chili packets they sell for chili 'Red Alarm', but more of 'out the exit door' kind of post! This is a GREAT recipe to have in my menu rotation...thanks for sharing...sounds delicious. 10 minutes?? That is super fast! :) Looks delicious! now THAT is my kind of recipe! Fast, barely any cooking involved, and it's soup...looove soup...in the UK they are obsessed with tomato and basil soup. Ugh. So making my own will be super! On the Mac, hold down 'Opt' while typing the letter 'n' and the letter to be accented to create characters with tilde accent marks. For the acute accent [on Memória], Press Option + e, and then press the letter you want accented. For upper case, press Option + e, and then press Shift + the letter you want accented. Love quick fast and easy! This looks great! Thanks for sharing it. Hola Laura, the soup looks awesome as well as the picture. I think I can make this. It seems that I am getting a computer and tilde lessons here also.I never use the "tildes" because I don't know how to find them either. I hear ya sister. There are definitely nights when I want to have just a teensy bit of Sandra Lee in me (although a bit healthier). And the funny thing is sometimes those are the best recipes. Um, this looks so delicious. I have an overwhelming urge to throw some browned hamburger in there (I have that urge a lot...I think it comes from growing up in the Midwest). This looks great! !Easy and yummy, my kind of recipe! Comfort in a bowl. I love it. It looks delicious to me...cheater soup or not! Oh wow - how easy! Looks amazing! Everyone need quick, easy and tasty recipes. This looks like one of those.